Facebook eliminates a privacy setting that allowed third parties to glean the names of users who participate in private, closed Facebook groups. The company also shuts down the Grouply.io Chrome extension that was designed to allow marketers to harvest such information on a large scale. The latter problem was discovered by the moderator of a group for BRCA-positive women who worried that their potential breast cancer information could be shared with insurance companies, with the extension’s behavior documented and reported to Facebook by healthcare technologist Fred Trotter. Market forces are driving all healthcare organizations to deliver patient care services in new, more efficient, and more cost-effective ways. BJC’s positioning for sustained long-term success in response to these pressures will rely increasingly on information technology and IT expertise for innovative solutions. As a business enabler, IT must increase focus on strategic priorities and align work and resources in support of these priorities. Reprioritizing the work towards improved system stability, strengthening of information protection, and disciplined execution requires changes in the IT staffing structure. This realignment includes an adjustment of skills and capabilities required in IT and will eliminate some current positions. In some cases, new job roles and responsibilities will be created to enable improved capabilities and assure accountability for execution as well. To adjust staffing levels to meet current priorities, we made the difficult decision to reduce the IT workforce effective July 11. The workforce reduction affects 68 employees and 45 IT contractors. We recognize any action that results in job loss has a significant impact on employees and their families. There is a comprehensive compensation and outplacement support package in place to assist those who are directly affected by this necessary action. The BJC human resources team is working closely with these affected colleagues to support them through this transition. The reduction initiates action towards a major transformation of our delivery capabilities where IT will realign resources to deliver against BJC’s most strategic intents. From Plebe: “Re: health IT influencer blogs. What do you think of this site’s list?” It’s not up to me to decide who influences whom, but I checked out the 32 sites and found that: (a) 13 are no longer online; (b) nine rarely post anything; and (c) the remaining 10 write something at least occasionally. I’m not getting into a quality debate on the content of those 10, but for most, their rather simplistic articles wouldn’t seem likely to influence anyone who themselves have actual influence. 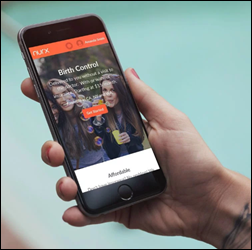 On-demand birth control delivery startup Nurx raises $36 million in a funding round led by Kleiner Perkins. The San Francisco-based company, which has raisd $41 million since launching four years ago, also offers access to anti-HIV medication and plans to offer at-home HIV testing lab kits. Alphabet’s Verily health business will partner with medical device company ResMed to apply sleep data to study the health and financial impacts of undiagnosed and untreated sleep apnea. I’m not sure how that will work since ResMed mostly sells CPAP equipment that would be prescribed only after a positive diagnosis for sleep apnea. Analysts predict that health IT company Henry Schein will downsize after a regulatory filing hints at plans to increase efficiencies. 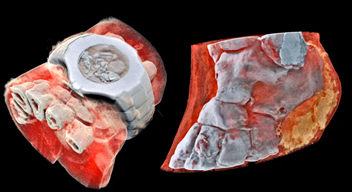 The Melville, NY-based company spun off its animal health business in April and announced a joint dental software venture with Internet Brands last week. Eric Pupo (Accenture) joins Columbia University Irving Medical Center as CIO. Divurgent hires Sarah Sample-Reif (Modis) as VP of client services. Hospital management company Candor Healthcare will implement MedSphere’s CareVue Cloud EHR at Rock Regional Hospital (KS) early next year as part of a facility-wide roll out that will include ChartLogic’s EHR and RCM software and services. Benefis Health System (MT) selects patient self-scheduling and EHR integration software from MyHealthDirect. Eagle Physicians & Associates (NC) opts for real-time patient care alerts from PatientPing. MemorialCare Health System (CA) chooses RTLS-based patient workflow technology from Vizzia Technologies. Virginia Hospital Center goes live on Bernoulli Health’s clinical surveillance, analytics, and medical device integration software. CompuGroup Medical announces GA of Electronic Videoconsulting. PatientSafe Solutions develops an app for rounding and clinical communications. 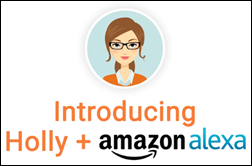 Allscripts, Athenahealth, CareCloud, and DrChrono users can offer patients appointment scheduling through Alexa using Nimblr’s virtual assistant, Holly. Integration with Epic is scheduled for Q3. CipherHealth introduces patient engagement technology for ACOs, including targeted outreach and care coordination tools. 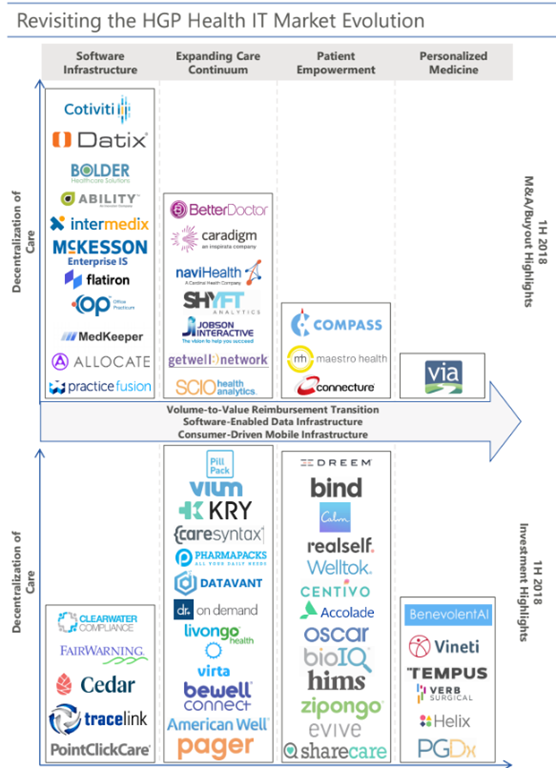 Despite $29 billion in health IT investment since 2014, broad impact on care delivery, cost, and outcomes has been muted, but value is accruing. Healthcare’s IT spending as a percentage of revenue is close to the average across all industries at 3.5 percent, but still runs about half of what banking and securities companies spend. That healthcare IT spending, however, has been spent on infrastructure and by providers switching from one EHR or billing system to another, gaining little improvement in cost and quality. M&A activity for smaller companies have three points at which value is assigned – proof-of-concept (the product can be sold and deployed commercially, with annual revenue less than $1 million); growth scalability (the company shows signs of profitability and growth scaling, with revenue $5-10 million), and mature scalability (the company takes on real infrastructure and begins to show strong profitability, with revenue $20 million and up). HGP’s HIT Index gained 25.7 percent in 2017 and added another 21.6 percent in the first quarter of 2018. Leading the Q1 HIT performance in share price change are Tabula Rasa Healthcare (up 128 percent), Connecture (up 116 percent), Evolent Health (up 71 percent), and Teladoc (up 67 percent). Bottom-performing in the Q1 HIT index are Inovalon Holdings (down 34 percent), Invitae (down 19 percent), Oneview Healthcare (down 19 percent), and Allscripts (down 18 percent). Health IT IPOs have dried up completely, with zero in 2017 and so far in 2018. A new KLAS report on non-US EHR activity finds that Epic gained 16,000 beds in signing six contracts in 2017, more than doubling its small, non-domestic market share as concerns about high-profile problems at Cambridge’s implementation in the UK faded. InterSystems continued its rapid growth, especially in smaller, multi-hospital organizations, while Cerner’s growth was moderate and lagged its primary competitors. The early days of the UK’s Global Digital Exemplar program has seen only four new contracts signed, of which Epic earned two, System C one, and Allscripts one. Virginia Hospital Center (VA) goes live on Bernoulli One for clinical surveillance, medical device integration, and real-time analytics. Advisory Board’s annual survey of health system CEOs finds that their top concern is preparing for sustainable cost control and creatively reducing expenses, followed by finding diversified revenue streams. A fast-growing #5 was meeting rising consumer demands for service. The House Committee on Veterans’ Affairs names to the subcommittee that will oversee the VA’s Cerner implementation Rep. Jim Banks (R-IN, chairman); Rep. Conor Lamb (D-PA, ranking member); Rep. Jack Bergman (R-MI); Rep. Mike Coffman (R-CO); and Rep. Scott Peters (D-CA). 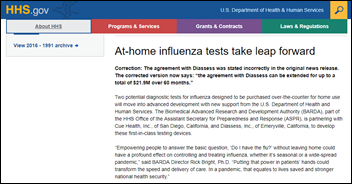 HHS awards Cue Health a $14 million contract to develop app-based flu-testing kits for the home and office that will include virtual consult and prescribing capabilities. The company announced a $45 million Series B funding round earlier this week. Diassess has been awarded a $10 million contract to develop a similar kit, though its focus will be on creating a disposable, battery-powered device for use during public health emergencies. Public health officials in Nashville, TN discover that the PHI of thousands of HIV patients was accessible to all employees on a Metro Public Health server for almost nine months. The database, typically accessed by a small group of physicians, is used to track and help patients living with HIV. Children’s Mercy Hospital (MO) faces its fourth data breach-related lawsuit, this time pertaining to an email phishing scam discovered in January that potentially exposed the data of 63,000 individuals. Children’s Mercy faced another suit from the same firm over a 2017 breach involving the PHI exposure of 5,500 patients. Two additional lawsuits involved the theft of paper records from employee vehicles. Fortified Health Security releases its mid-year cybersecurity report, noting that 28 percent of breaches so far this year involved an email attack. 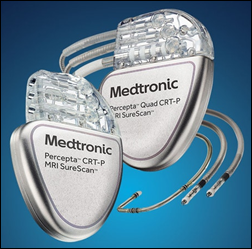 The FDA issues recalls on 39,000 Medtronic implantable heart devices after the company alerts providers that the devices need software updates to avoid potentially adverse events. UC Health’s tools include UC-Rex, a search engine for anonymized patient information, and Epic’s SlicerDicer, which creates patient cohorts from EHR data. Studies now start with looking at what has happened to patients clinically, then getting IRB approval to dig deeper. Information that is being added to the data warehouse includes patient satisfaction and survey results, hospital operations data, claims data, and eventually genomics data. Data analysis includes looking at how physicians spend their time and looking for potential burnout risk factors. CNBC reports that Amazon and Xealth, a digital prescribing and analytics startup, are in talks with several health systems to develop bundled medical product recommendation and delivery services for patients just before discharge. Weird News Andy is proud as a peacock that New Zealand scientists have performed the first 3-D, color X-ray on a human. CarePort Health extends its discharge planning and referral management software agreement with Jackson Health System (FL), and helps JHS integrate its software with the hospital’s Cerner EHR. Elsevier Clinical Solutions will exhibit at the APC 2018 Annual Meeting July 15 in San Diego. EClinicalWorks will exhibit at the 2018 FSASC Annual Conference July 18-20 in Orlando. Optimum Healthcare IT publishes a video describing SkillMarket, software to manage EHR go-live resource evaluation, compliance, and scheduling. IMAT Solutions will exhibit at HealthImpact East July 18-20 in Washington, DC. Butler Health System (PA) achieves 97-percent patient-matching accuracy using solutions from LexisNexis Risk Solutions and Occam Technologies. Medicare claims data is a strong data source on which latest data science tools can be applied resulting in predictions that are indeed intelligent. Would appreciate some thoughts on data quality on QPP data. Based on QPP data many VBC and other predictive care models may be developed in future by CMS. How does one determine the veracity of the QPP data warehouse. Maybe a webinar by data science experts on medicare data like Fred T can help. What are the data quality audit tools deployed by QPP programs that checks that the data submitted in indeed correct. The national benchmarks published by CMS are based on data collected by QPP/MIPS. Are the data science tools smart enough catch and weed out incorrect data submissions by technology vendors. It is always easy to fudge data to pretend a physician has higher quality that what is reality..
Wow. The communication director for BJC needs a communication director for her own messaging. You START the public statement about how bad you feel for the people whose lives you just turned upside down. You don’t bury that sentiment after two lengthy paragraphs about ‘market forces’. This should be a PR no brainer in today’s hyper-sensitive environment for businesses who face these tough decisions. I’d be willing to argue gender bias in Forbes’ estimate of Judy Faulkner’s net worth. We believe that she holds a “controlling interest” in Epic. Presumably at least half. So you’re telling me that Epic is worth ~$7B? One third as much as Cerner? 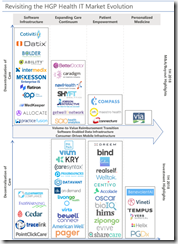 Basically the same as athenahealth? Perhaps they’re excluding the shares that she put into a foundation in 2015…except that they pegged her net worth at $2.6B in 2014…so that’s not the answer. 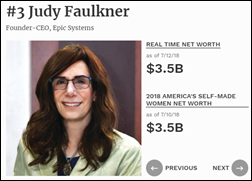 My bet is that Epic would fetch well north of $14B in the public markets…making Ms. Faulkner #1 on the “self made women” list by a pretty wide margin (unless, somehow, she controls the company with much less than 50% equity ownership).